Do you have a minute to spare to learn some English? Then join Dan, who has a quick and simple lesson about the difference between the words history and story. Give us 60 seconds and we'll give you the English! 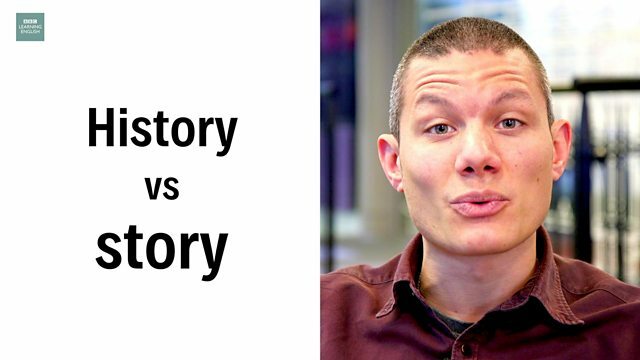 Hi, I’m Dan from BBC Learning English and today I’m going to tell you the difference between those two confusing words history and story. So, both words are used for a description of events. So that makes them the same, right? WRONG! They are not the same. A story is the description of a series of real or imagined events, often to entertain people. 'After arriving in America in 1492, Columbus and his crew were attacked by a giant man-eating T-Rex dinosaur!' That didn’t happen! It’s just a story. So… history is the description of past events based on fact and stories are descriptions of real or imagined events, often to entertain. Leave us a comment below about a piece of history or an imagined story from your culture! We’ll try and guess which is which! the description or study of past events based on fact, often to understand their consequences. Columbus arrived in America in 1492.
a description of series of real or imagined events, often to entertain. After arriving in America in 1492, Columbus and his crew were attacked by a giant man-eating T-Rex dinosaur. The Berlin Wall fell in 1989 - history or story? Did Sherlock Holmes really live? Sherlock Holmes lived in a flat in Baker Street, London - story or history? Is this a description of a true or imagined event? He said he was late because his bus was delayed, but no one believes his ______. We'd like to hear a piece of history or stories from your culture. Send us an email with 'Story' in the subject box and we'll publish our favourites on this page. When prince Pribina, as a young man, came into power in Nitra (Central Europe, Slovakia), his principality had long-lasting history. Though he was a pagan, he ordered to build the Christian church, which was meant to serve his Christian wife and her court. The wife of Pribina was born into a Bavarian earl family of Wilhelm, as witnessed not only by her dowry, but also by the name she gave to her son Koceľ. The Bavarian form of the name Koceľ (Gozil) is known from two letters of Pope John VIII written in 873 AD. The church in Nitra was consecrated by Adalram, the archbishop of Salzburg, who visited Nitra in 828 AD. In my city there is a bronze sculpture that is a tribute to a photographer already disappeared. It's a little horse like the one he had. Almost every child in the fifties of the last century had a picture with that little horse. One day last month I made another photo with sixty years riding on the horse. General San Martin crossed the Andes in mules, he was very ill but even though, he was able to give freedom to three countries, Argentina, Chile and Peru. There was an attempt to give freedom to Uruguay too. Once upon a time in a low land savanna of east Africa, lived a man and his wife and their four sons.They were herdsmen. People's population then were not so big as it was for hyenas in this place.No government was there yet.And there were no laws to guide people but they were guided by traditional rules and protected themselves against bandit and wild animals by staying together as a groups formed of families and clans.But this family now where they were living now it was a far as they had scatteted by need for searching pastures for their herds because there was a famine which had been staying there for a long long time.so they had just came there in search for their herds pastures. But this place also started getting dry and dry. The herds began to decrease. After some times an infectious mosquito virus break out there.